As the President returns from his world wide Groveling Tour. Where he and the missus show a lack of respect and protocol to our ally the queen, while bowing before a tyrant and spiritual adversary the Saudi King. The buffoon parade ends as he arrives home to cut the military budget. In the beginning of a world war when the administration is tossing Trillions down the bailout drain, while unconstitutionally stealing control of private industry. They have decided to enact massive military spending cuts. Following in the footsteps of his clone Carter and the misogynist Bill Clinton, the Military is the only part of the government that will see a decrease. Now it's one thing cutting missile defense even though the malignant midget in N Korea launched an ICBM right while the Obamanation was giving a speech on Nuclear Disarmament. The fools that act as the brain trust of our government are cutting the number one weapons platform in our modern arsenal. Calling his plan a “reform budget,” Gates said he would eliminate the F-22 Raptor at 187 aircraft. That leaves 187 aircraft to replace the over 700 plane fleet of f-15 and f-18 fighters. Now mind you those aircraft when they came on line replaced 2400 f-4s. This however is the equivalent of shooting Secretariat right before the Triple Crown was run. 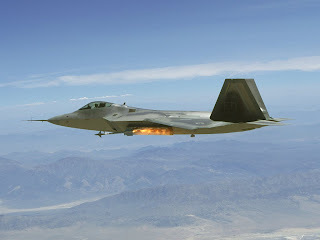 The Raptor is the most deadly aircraft ever built. There is no plane made by any other nation that comes close. The Chicoms have crap, and the Russians have a high tech bird that is very good but is not a stealth craft like the Raptor. The Raptor flies higher with an almost invisible signature with the capability to see and shoot down other craft that are still over the horizon. It is also the most maneuverable fighter craft ever designed making it next to impossible defeat in a dog fight due to a new revolution in flight control design. It is our sweeper weapon they fly in and clear the sky of all other craft before they even come into the enemies range. They then can deliver devastating ground strike capability once they get to that combat area. Non of this means anything to groveling apologists that now control the levers of power in Washington to them it's just time to cut what they hate, American Superiority.